December is here at last! Depending on your location it can be time for lots of snow, or maybe just hopes for snow in time for Christmas. Either way, December is a great time for unique content that revolves around the Christmas holiday, and even some that takes a peek toward the coming New Year. 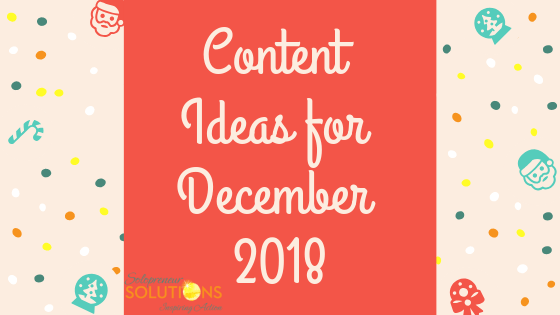 Before listing the actual holidays and fun birthdays for December, here are a few suggestions for content series or campaigns that fit the December / holiday season. Following a “12 Days of Christmas” theme, you could consider sharing 12 of your most popular products or services over a span of 12 days, or even a favorite consumer tip for the holidays over 12 days. Begin early enough to solicit input from your followers on social media and include their tips and suggestions, giving credit to the authors. List content is always popular and listed topics always rank high in searches. Consider publishing your retrospective or predictive content in the form of a top 10 listicle. Here are a few ideas. HIV/AIDS is one of the world’s largest medical crises. It is estimated that approximately 40 million people in the world currently suffer from AIDS. About one million are in the United States. Each year, over 40,000 new cases are reported in the U.S. alone. On this day, promote education about this disease, and protection against it. Encourage others to help people with AIDS and donate to the fight to end this disease. Chanukah, the Festival of Lights, (commonly called Hanukah) celebrates victory from Greek religious persecution. The Jewish victory was led by the Maccabees in the year 167 B.C. Upon returning to the temple to rededicate it and relight the Menorah, the Maccabees found only one small flask of oil, enough to light the Menorah for just one day. However, the flask of oil lasted eight days. Therefore, the celebration lasts eight days. This is also why it is called the Festival of Lights. Small gifts are given to family and friends each of the eight days of Chanukah. Advent begins four Sundays before Christmas. It is a holy season in the Christian calendar and the beginning of the liturgical calendar. Christians wait and prepare for the coming of the Lord Jesus, whose birth we celebrate on Christmas. In the early days of the Christian church, Advent was a time of prayer and confession. Today, Advent is more a time of preparation and expectation of the coming of the Lord. Various symbols are used in celebrations, such as wreaths and candles. Winter Solstice marks the beginning of winter and is the shortest day of the year. At the North Pole, the sun never rises on this day. It is not the coldest days of winter, as the northern hemisphere continues to lose more heat than it gains. This will continue until late in winter, as the longer daylight hours at that point begin to have a net warming affect. For thousands of years, Winter Solstice has celebrated the new solar year. It celebrates the return of the sun, as every day now will see more sun. The sun is at its southernmost point, and now begins its long, six month journey north. Christmas is the biggest holiday of the year. Christmas has both a strong religious and traditional meaning. It has a certain feel, all to itself, that you usually do not feel at any other time of the year. It creates within most a sense of kindness and concern for fellow man. At no other time are we more generous and giving. It creates a sense of family and belonging. Merry Christmas! If Christmas falls on a Friday or a Saturday, Boxing Day is the following Monday. It is celebrated in England, Australia, Canada, New Zealand, and other former British Commonwealth countries. Boxing Day was an expression of appreciation and thanks, much like Christmas tips are today. The roots of the holiday goes back to the Middle Ages. On this day, members of the merchant class would take boxes, fill them with food and fruits, and give them to servants, tradespeople, and the less fortunate. Today, the giving of boxes includes filling boxes with food and clothing for the needy and performing volunteer work. What special days or observances grab your interest in December? Are there holiday events or happenings that will attract customers or impact your business? Share them in the comments and of course, share them with your readers! Until next month (and next year), stay warm, enjoy any snow you get, give plenty of gifts, and as always, keep writing!